The New York Times somehow let an all too true story about the treatment of mental illness slip through today instead of one of their more typical speculative pieces. It is a story of a family desperately trying to get their father and husband assistance after he develops acute bipolar disorder with psychotic symptoms. It is a reasonable discussion of some of the issues behind deinstitutionalization, involuntary treatment, and the sad state of affairs that currently exists in trying to get treatment for those with severe mental illness. I will refrain from the typical term applied to the situations whose definition is: "a particularly bad or critical state of affairs, arising from a number of negative or unpredictable factors". The reason I will refrain is that it is not exactly accurate. The entire debacle has been totally predictable. It is the predictable result of applying managed care rationing techniques to the private and public mental health sector and denying care to those people with the most severe forms of mental illness. When your only perspective is rationing care to make money - there are no standards. They are fairly straightforward. First off, there needs to be reasonable commitment standards with a more appropriate balance than "imminent dangerousnessness". From the article it is clear that even that standard is interpreted widely. There needs to be a three part standard for danger to self, danger to others, and gravely disabled and not able to care for oneself. Some states accomplish the same goals by separating civil commitment from protective services/protective placement statutes. The latter approach has the advantage of avoiding the use of commitment courts for issues that come up in the course of Alzheimer's disease and other dementias. Secondly, the statutes need to be uniformly interpreted. My experience working with probate courts from a 3 county area illustrates that no two judges would make the same decision on a particular case. In many counties, the social workers screening the cases had much different philosophies. The only time that changed was when there was a bad outcome. That outcome was typically a person released by the court who attempted or committed a homicide or suicide. Third, there needs to be recognition that state hospital beds are not the only solution. The main reason that state hospital beds don't work is that there are no local resources. Once a person is ready for discharge, there is no place to send them. More and more people accumulate at the state hospital and nobody is discharged. There needs to be housing resources and community teams to actively work with people to facilitate discharge and maintain them in the community. Just building state hospital beds has the predictable outcome of building more state hospital beds. Fourth, financial conflicts of interest must be eliminated. They exist at multiple levels and are the predictable outcome of rationing techniques that originated in the managed care industry 30 years ago. The basic premise of managed care is that a "medical necessity" standard can be developed that will be subjectively interpreted by the company in order to ration care and save the company money. One of the major loopholes has been any person that needs involuntary treatment. The managed care company can simply say this care is no longer "acute" or "medically necessary" and transfer the financial burden of care to the taxpayers. Huge cost savings to the managed care company. That doesn't happen if you need a heart transplant. The financial conflicts of interest occur at every level in the system. Another example is the interpretation that at an aggressive or self endangering event has to have occurred in order to meet the commitment standard. The author here does a good job of providing examples. What is not obvious is the financial conflict of interest that is present in these situations. In almost all cases - the hearing occurs at the county level and the judge presiding knows the county's financial status and access to resources. That significantly biases decisions especially in the case of counties where there are limited resources. The only solution to avoiding these pure conflicts of interest is to have the money follow the patient and have it in a dedicated fund. It is too easy to move funds around that should be designated for the treatment of severe mental illness if they move in and out of a general fund. Fifth, there need to be better managers of the systems responsible for the care of patients with severe mental illnesses. Managed care companies clearly do a very poor job. On the other hand every state generally has a large Department of Human Services and second to education they are usually the largest budget in the state. Despite significant constant and high demands they are generally managed like any other state agency. If there is a revenue shortfall and everybody has a 6% across the board spending cut, DHS also has a 6% spending cut. These departments usually employ cost center accounting that is also a detriment to coming up with an adequate plan of care across treatment settings. Finally it is also common these days in both managed care and state systems to see managers with no clinical experience attempting to hold clinicians accountable to subjective standards and implementing plans to change care delivery - even though they have no expertise. These are a few changes that would make a world of difference for families and patients like those mentioned in the NYTimes article today. I am not very hopeful that they can happen because it would also involve changing a culture that has been the most insidious aspect of managed care. That culture is quite simply - bureaucrats and business people telling psychiatrists what to do and restricting the resources needed to provide adequate care. Jennen Interlandi. When My Crazy Father Actually Lost His Mind. NYTimes June 22, 2012. You + Me -> working on your problems. That is the basic paradigm for treatment. It assumes that the psychiatrists is competent and professional. Assumptions about the patient are less clear. 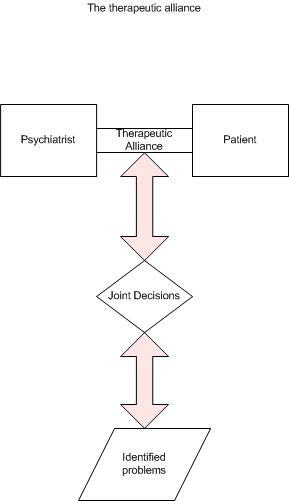 In the ideal situation, the patient is aware of the therapeutic alliance and focused on examining and solving problems. There are a wide array of problems that can be the focus of treatment. The approach generally works very well but there are things that can derail it. In the course of treatment, emotionally loaded topics are discussed. In some cases the emotions of patients and psychiatrists impinge on the alliance and need to be clarified. There are boundary issues that often bias treatment in a particular direction. A common example is a friend or family member referring a person into treatment. These days there are important factors outside of treatment that bias treatment as indicated in the following diagram. In this case, the patient and psychiatrist can have an excellent working alliance. They can be focused on solving problems by applying the best possible evidence based medicine or consensus guidelines, but the best course of treatment that they agree on is not funded by the managed care company or pharmaceutical benefit manager. A common example these days would be a patient with depression and back pain. I frequently recommend duloxetine, especially in the case of failed treatment with SSRI type antidepressants. Even in the case where this treatment is effective for both depression and back pain, the PBM can either refuse to pay for the medication or make the copay so high that the patient cannot afford it. On the inpatient side, a common scenario is the manic patient who is not able to function unsupervised at home or in transitional care. The managed care company can say that the patient is "not a danger to self or others" and insist that they be discharged form the hospital. That is probably one of the most frequent reasons for readmission. In other cases, managed care companies declare that the patient is no longer at risk for suicide. Their reviewers make this decision based on reading chart notes or talking to the doctor who thinks that the suicide risk is still high. 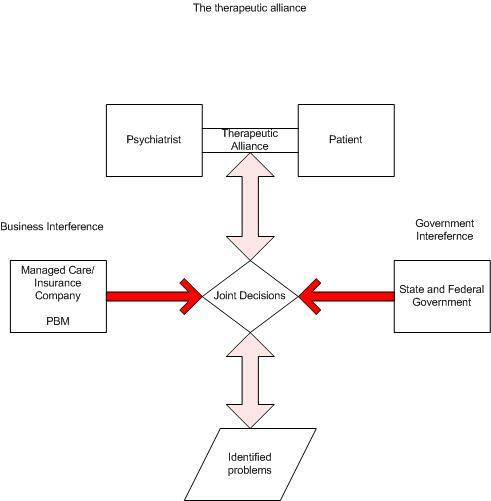 In the majority of cases they decide against the attending physician - probably the most egregious breach of the therapeutic alliance especially when the patient is as concerned as the psychiatrist. The government also intrudes at multiple levels. The biggest intrusion has been by facilitating the development of both managed care and PBMs. These are businesses that were essentially invented by the government in order to reduce the cost of health acre. After two decades it is clear that health care inflation is as high as ever, that mental health services have been cut to the bone, and that public mental health services that have adapted managed care strategies have a also dramatically reduced services. In almost all cases, the government advances a purely political experiment that results in numerous inefficiencies that fails to produce results. Some common example include failed pay for performance initiatives and a failure to reduce Medicare readmissions based on financial incentives and disincentives. Practically all of these experiments use the administrators assumption that physicians don't know what they are doing in the first place. That is probably not the best place to start. There are many political influences that are not on the diagram. Direct to consumer advertising, the media, and various advocacy groups are additional examples. Psychiatry is unique in that there are a number of causes dedicated to the most negative characterizations or destruction of the field. That orientation not only precludes any therapeutic alliance but also may lead to intrusions on existing or initial alliances. I saw an article recently that reminded me that at one time in my life, I wanted to be a limnologist. I studied water chemistry and all of the little known plant and animal life in freshwater rivers and lakes. At one point I was standing out on a frozen section of Lake Superior hand pumping 50 gallons of water through a plankton sampler. The Fathead minnow (Pimephales promelas) was not a stranger to me. In this experiment, the researchers were focused on the effect of medications in the water supply. This phenomenon has been widely reported (1, 2, 3, 6). The issue of whether exposure to low levels of pharmaceuticals in the water supply is problematic is controversial (4, 5). The researchers used a gene expression study to show that a mixture of unmetabolized psychoactive pharmaceuticals (UPPs) can induce an Autism Spectrum Disorder-like gene expression profile in the fathead minnow. In this case the UPPs used were fluoxetine, venlafaxine, and carbamazepine used in concentrations that were about one order of magnitude greater than observed concentrations in drinking water, rivers and wastewater. The greatest concentration in the water systems occurred in either wastewater treatment plant effluent or the water system downstream from the plant. The authors conclude that their experiment shows that psychoactive drugs at low concentrations may be an environmental trigger for individuals susceptible to autism. Reading this paper also reminded me of a paper I had read in Science several years ago on the production of fluorinated pharmaceuticals. It is a little known fact that there are very few naturally occurring fluorinated molecules in biological systems. Advances in organic chemistry made it possible to easily fluorinate molecules for medicinal purposes and several of the more well known medications like Prozac (fluoxetine) and Lipitor (atorvastatin) are members of that new class of molecules. The solution to the problem is the same solution I was taught as a tree hugger over 30 years ago. Keep potential pollutants out of the water supply. No pharmaceuticals should be dumped into the water supply. In the solid unused form they should be completely incinerated, hopefully in a plasma furnace. Wastewater treatment needs to engineer new methods to remove both unmetabolized and metabolized pharmaceuticals from the wastewater effluent. These are preliminary results that need widespread replication, but from an environmental perspective adding novel biologically active compounds to the environment and not expecting unintended consequences does not seem to be a very well thought out course of action to me. intuition. Science. 2007 Sep 28;317(5846):1881-6. Review. PubMed PMID: 17901324. In a word - computers. I had the good fortune of training with John Greist, MD at the University of Wisconsin in the 1980s. Interestingly, many people have the opinion that Dr. Greist is firmly in the camp of biomedical psychiatry. He and his long time colleague James Jefferson, MD regularly give Door County symposia on the medical treatment of mood and anxiety disorders. They are highly regarded for their scholarship and teaching ability. If you haven't listened closely enough over the years, you might miss the fact that Dr. Greist has consistently pointed out the superiority of psychotherapy for various conditions and that computerized versions of the same psychotherapy perform as well as seeing a therapist. At a recent MPS meeting, Dr. Greist gave a presentation on computerized therapy. He made a compelling argument for computerized psychotherapy based on a recent meta-analysis of effectiveness and a comparison of the cost effectiveness of developing moderately effective drugs compared to very cost effective and potentially more effective computerized psychotherapies. He was an innovator in the field publishing some of the original research and designing some of the original software. At this meeting he made a strong argument that the software is inexpensive, potentially as effective and more consistent than human therapists and for many conditions more effective than medication. If there was any market value in the existing mental health field, Dr. Greist's concept would be disruptive. It would potentially change the way that treatment is provided, especially treatment of anxiety and mood disorders. Think about the way that treatment of these disorders is currently delivered. Twenty percent of the adult population is at annual risk. About 40 percent of that group seeks treatment primarily through primary care clinics. Very few people see psychiatrists and very few people need to. The standard of care for almost everyone else is taking a medication prescribed by a primary care clinic. Many people are treated with benzodiazepines and sedative hypnotic medications that have no efficacy in anxiety or depression and they continue these medications on a chronic basis. If psychotherapy is available it is two or three sessions of crisis intervention or supportive psychotherapy rather than research proven therapy for a specific disorder. The lack of availability of psychotherapy in the health care system is another direct result of managed care and rationing. Managing most of the anxiety and depression with medications and brief visits is ideal for the bean counters. Outpatient clinics become an assembly line of 15 minute "med checks". The only reality is a medication and whether that medication works and is tolerated. An occasional manager may insist that the clinic double book patients to compensate for missed appointments or extra appointments to generate more revenue. I noticed today in an effort to send an e-mail to my internist that his primary care clinic offers e-mail consults on treating anxiety and depression for $40. That is about what most psychiatrists get paid for a face-to face consultation. I wonder if the $40 fee includes a description of the psychotherapies that might work better than medication? Enter computerized psychotherapy. Instead of waiting to get into a clinic that is based solely on medications, a person with anxiety and or depression accesses an Internet Clinic and proceeds through a number of self-guided and computerized cognitive behavioral therapy options. There are options for preferences, combination therapies, and inadequate response to computerized therapy. There is no need to travel to a clinic and there is no waiting. The therapy is available on demand and for free. The cost of treating thousands of patients is trivial, basically limited to staff to maintain the web site, collect treatment data, analyze outcomes, and modify the software as necessary. All of this has been a known possibility for about two decades. Why isn't it happening? Why is mental health treatment limited to medications when psychotherapy, even by a machine is superior in many cases? Over those two decades we have seen unprecedented rationing of mental health services. We have seen what used to be clinical decisions turned into business decisions. The end result has not only been lower quality clinical care but a complete lack of innovation. It is time for the pendulum to swing back in the right direction. A Positive Review of DSM5? In the New York Times? I know it is hard to believe. Something about psychiatry in the NY Times that is not spun as negatively as possible. One blogger referred to the phenomenon as "New York Times Psychiatry". But today there is a positive review of the addiction section of DSM5. No spin on how the DSM is a carefully crafted plot by psychiatry to diagnose all Americans with a mental illness or collude with Big Pharma to sell more drugs. Instead an author suggesting that there may be a scientific basis for these decisions. And as we all know, science is a process and not a set of definitive answers. Could science actually be the organizing force in the DSM rather than what we typically hear in the media? This is a brief scholarly essay on the history of the concept of addiction and the current neurobiological underpinnings. It should be no surprise that with the accumulation of knowledge that the concepts of what is an addiction and what is not changes over time. Just like everything else in the DSM and just like everything else in the field of medicine. It is not a conspiracy or a plot - it naturally happens as knowledge accumulates and we get more sophisticated. Howard Markel. DSM 5 Gets Addiction Right. NY Times June 5, 2012. "We live in turbulent economic times and may have a right to be gloomy, but I was quite disturbed to hear speaker after speaker predicting the demise of our profession or its absorption into neurology or some other discipline, as the funding for mental illness and respect for psychiatrists gets progressively less." There is probably no better recipe for the demise of a profession than continuing to obsess about the future. Pick a direction, any direction and the critics be damned. It seems that the personality of most psychiatrists does not allow for that action. We can dissect how psychiatrists as a group may be different from other specialists but I think the problem is that introspection and the need to understand motivations and emotions has translated into a lack of action and a really very annoying tendency to never take a stand. I have also observed and equally annoying trait of uncritically accepting any criticism that comes down the pike as though it is generally legitimate. All of the maladies in Dr. Tyrer’s piece including stigma, decreased funding, and a lack of respect for psychiatry come from those places. Tyrer goes on to say that he sees no connection between stigmatization and discrimination and psychiatry’s lack of direction. Let me suggest that at many levels this is the perception of a lack of direction. The psychiatrists I know are trained to high levels of competency, technically skilled and care about what happens to their patients. They successfully treat mental illness, save lives, correct misdiagnoses, and improve the lives of millions of people. What they do every day differs considerably from what is written in the American press. The sensational and inaccurate headlines can only be countered by aggressive political activity against all of the distortion that is typically being passed about psychiatrists. For a moment, I was going to write that this is an American phenomenon, but then I recalled the work of Claire Bithell in the UK, showing that coverage of psychiatry was less often than other specialties and when it did happen it was four times as likely to be negatively framed. How about at least getting the word out that this trend exists and it biases people at all levels including the people who are responsible for funding treatment? Here in the US, an unrealistically negative press feeds into a health care system that is set up to exploit patients with mental illness and the mental health professionals trying to treat them by providing disproportionately less funding. It was so blatant that a parity law had to be passed to attempt to counter that discrimination. But even as I type this note, large health insurance companies are trying to figure out a way to avoid paying for specific treatment settings, therapies, and drugs recommended by psychiatrists. Nothing helps their cause more than propaganda against psychiatrists. So let’s break the deadlock of continuing to obsess about the future of a specialty when the current practitioners know what they are doing and treat people as successfully as they get treated by any other specialists. This is not about the difference between psychotherapy or medications or treatment philosophies. This is about the difference between a stroke and a psychiatric disorder. I have had to educate many practitioners about that difference over the years, always when they were misdiagnosed with a mental illness. Some of those practitioners were neurologists. That is proof of an unique skill set that nobody else in medicine seems to have and for psychiatry that is just the tip of the skill set iceberg.